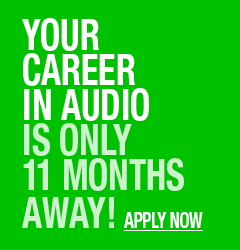 YOUR CAREER IN AUDIO is Only 12 Months Away! VIRTUAL TOUR Experience CRAS Now! When choosing among audio engineering schools it’s important to understand the differences between them, as not all audio production schools provide an equal level of education. Many audio engineering schools offer their content online, and while this may seem sufficient, or even cool... learning the art of recording requires many “soft skills” that can only be learned hands-on. 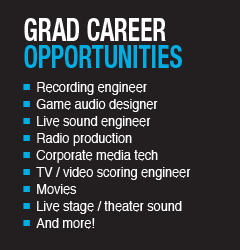 If you’re looking to learn audio engineering, CRAS is the only school that is totally hands-on, all the time. In our labs and studios, CRAS students get to learn in an environment that is not similar to, but rather exactly like the ones they will encounter in the field. This real world experience not only educates, but also instills a level of confidence that allows CRAS students to excel in their dream job in audio. CRAS is also unique amongst other audio engineering schools in that its faculty is made up of industry pros. This elite group of educators shares their industry expertise with students in small classes which are kept to a maximum of 12 students per class, ensuring that every student gets both hands-on experience and face time with the equipment and the instructors. This approach to music education provides our students with training they’ll actually retain, and has allowed many of our graduates the opportunities to work with some of the biggest names in the music industry, from Justin Bieber and Usher to Taylor Swift and more. Studying at CRAS will be one of the best decisions you’ll ever make. 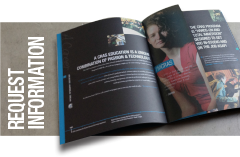 When you consider all of these factors, it’s clear that CRAS is the premier choice for audio recording schools. If you’re ready to take the next step down this incredible career path, simply click Apply Now to start the process! CRAS Graduates have engineered, mixed and or produced numerous albums that have been recognized throughout the music and recording industry. ©2013 Conservatory of Recording Arts and Sciences. CRAS is a registered trademark of the Conservatory of Recording Arts & Sciences.